17/02/1910 Two Step for couples, Hockey Match, Needle and Thread for couples, Egg and Spoon Race for Ladies, Speed Race, Chariot Race, (2 men as horses, blindfolded, plus lady driver). 09/11/1910 Ladies hoop race, potato race, egg and spoon race plus a mixed musical chairs. A confetti battle to end the night. 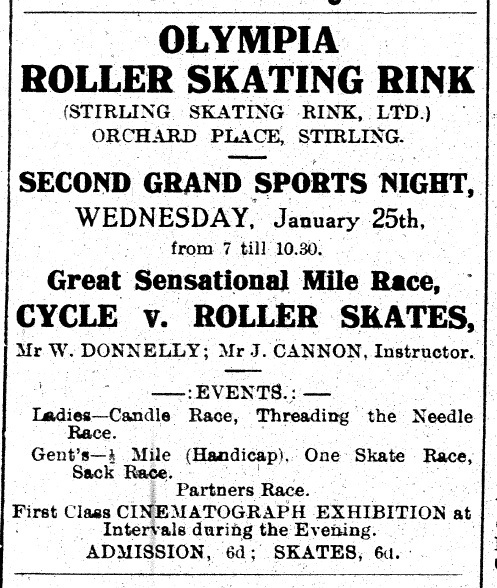 25/01/1911 Cyclist v Skater, Half Mile Race, One Skate Race, Sack Race, Candle Race, Needle and Thread Race, Partners Race. 08/03/1911 Weight lifting exhibition, Ladies two step competition, Musical chairs for ladies, Gents punting race, Gents musical chairs, Tug-of-war. 13/03/1911 Wrestling Exhibition, Ladies hockey match. 29/03/1911 Juvenile Dancing Championship in costume. Sports Night, 17th February 1910 as reported in Stirling Observer 23rd February 1910. An Apple race for children under 14 was cancelled due to lack of entrants. There was a successful two-step competition and needle and thread race for couples. There was an egg and spoon race for ladies only. They used potatoes rather than eggs which saved the floor from being a mess. The speed race required two heats with 3 competitors each, finishing with the final. This was won by 2 members of the hockey team. The chariot race involved two men blind folded acting as the horses and a woman driver. This provided much entertainment for the spectators due to the mishaps of the blind folded men skating under the direction of the lady driver alone. There were prizes for all the winners. 25th January sports event, as reported on 31st Jan Stirling Observer. A one mile Cyclist v Skater race was won by the cyclist by half a lap, being constrained by the small size of the rink. 16 competitors took part in the half mile race which had to be run in heats. The one skate race was easily won by someone who clearly had run it before. The sack race was not so easy; one competitor fell headlong and took a while to recover. Few ladies took part in their competitions of candle race and needle and thread race. The partners race involved lady and gentleman partners racing together. Cinematograph proved the most popular event which pointed to the future direction of entertainment and the ultimate fate of the premises. 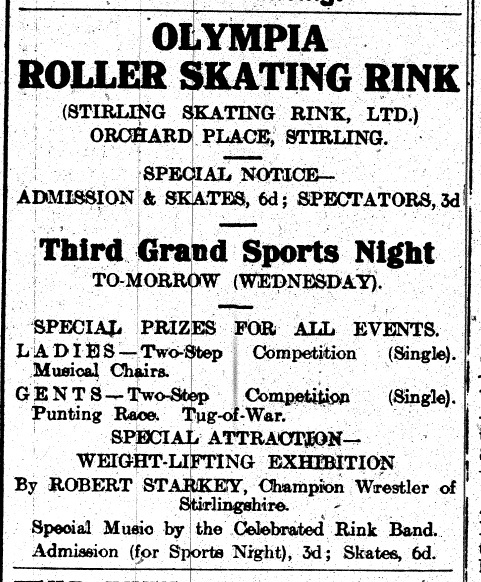 8th March third Grand Sports Night, reported on 14th March 1911 Stirling Observer. Almost 1000 spectators and skaters were at the event. There was a weight lifting exhibition, Ladies two step competition, musical chairs for ladies, Gents punting race, Gents musical chairs and Tug-of-war. 13th March Wrestling Exhibition as reported on 21st March Stirling Observer. Almost 1000 spectators turned up to witness a bout between R Starkey, champion of Stirlingshire against Jack Parr from Glasgow, the champion of Britain. 29th March Juveniles competition as reported on 4th April, Stirling Observer. 10 contestants, each doing the Highland Fling, Sailors Hornpipe and Irish Jig to the pipe music supplied by Mr C. McIsaac. The dancing took so long that it could not finish on the night and so the final was arranged for the last night. The Sports Nights started off life as skater events offering challenges on roller skates for prizes to entertain spectators, but became more about bringing spectators in to watch pre-arranged events like wrestling and Cinematograph as skating became less popular.